I talked about the Poor House Bistro some time ago, and what I said then still stands. It’s a fine outpost, a respectable po’ boy in an area where such a thing isn’t in abundance. The reason I bring it up again is to draw a contrast to the Braised Onion French Dip featured on Monday. Both are very good sandwiches, both centered around a big pile of meat, but the things that accompany the Drippin’s are doing something very different than the French Dip from Oaks. Oaks had each ingredient trying to make its own mark: truffled watercress, sherry au jus and braised onions are all an ingredient plus an additional bit of spin. There’s nothing inherently wrong with that, but it makes a sandwich significantly harder to balance; featuring six things is always going to be harder than featuring one thing. Poor House Bistro takes a more simple approach, in which the support is the support. 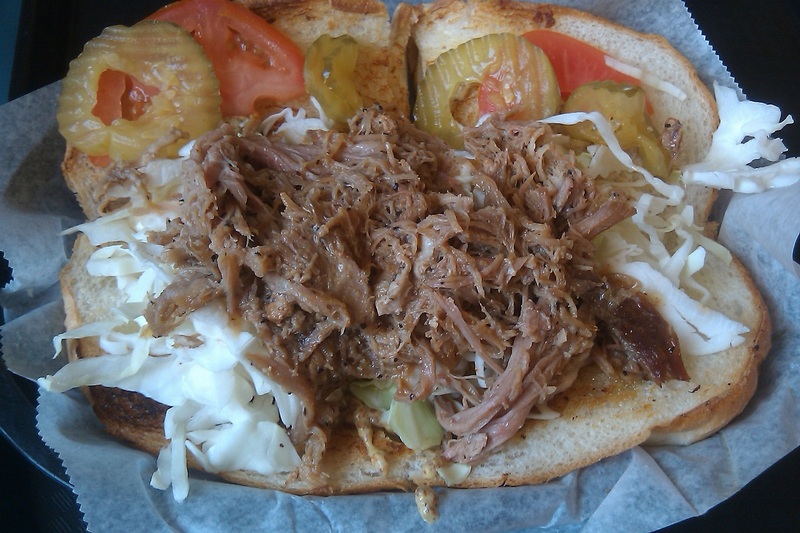 In addition to the roast pork the sandwich features tomatoes, pickles, shredded cabbage and mustard. That’s not the default “everything,” most sandwiches at Poor House Bistro include mayo by default, but they leave if off the Drippin’s, much to the sandwich’s benefit. Leaving the mayo off gives the cabbage a crisp freshness that pairs quite well with the richness of the pork. This isn’t a question of laziness, it’s just a matter of understanding the sandwich. You’re there for juicy, tender, savory, and just peppery enough pork, and that’s exactly what you get. 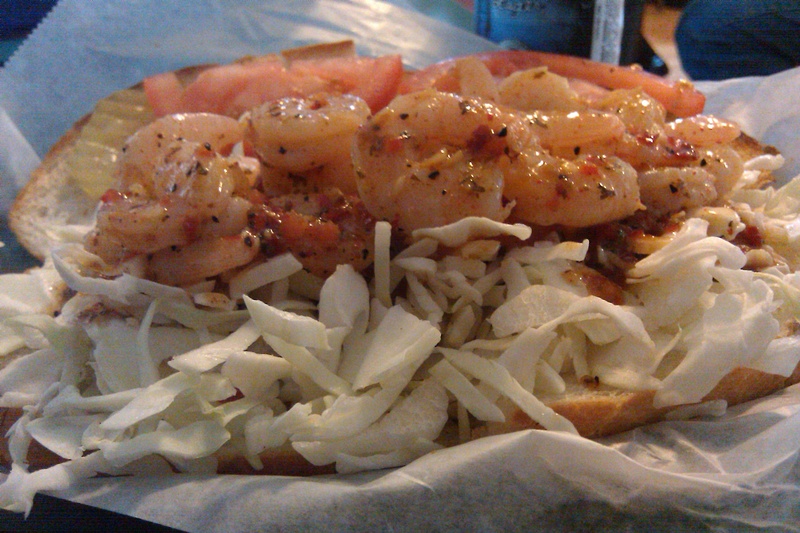 I have also tried the BBQ Shrimp Po’ Boy at Poor House Bistro, and it struck me as one of those sandwiches where if it’s your thing, you’ll love it, but if not there isn’t much appealing about it. It’s incredibly heavy on the pepper, and while I do enjoy spicy foods I felt like this was a bit much, one strong note without much support at all. If pepper is your thing, by all means. If you lack that enthusiasm, though, the Drippin’s or one of the fried numbers is likely to set you right. This entry was posted in Sandwich Reviews and tagged Pork, Reviews by Pete, San Jose, Sandwiches I Have Eaten by Pete. Bookmark the permalink. Man, I rarely look at a sandwich and feel the need to eat that sandwich, but The Drippin’s is making me hungry.